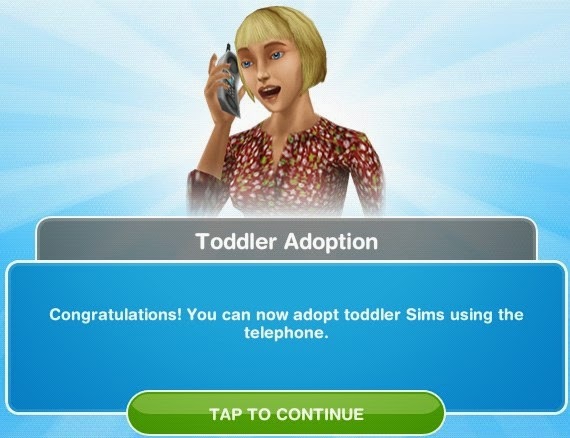 This is a time-limited quest-line, you're given 2 days to unlock the ability to grow your babies into Toddlers, as well as have access to the "Adopt a Toddler" purchase action available via Sim's phones within the game. Reward: The Dress-Up Chest (Available in Online Store if you did not finish in time). This quest was last verified on the Glitz and Glam update (Sept. 2015). 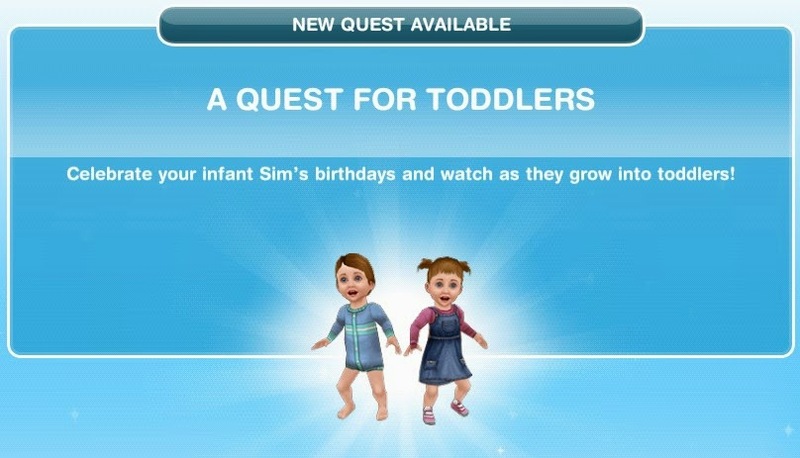 Grow your baby Sims into Toddlers! Toddlers love toys and there are loads of toys they can play with that are just for them such as rocking horses, slot cars, swings, sand pits and more! (Aw, what a great show! Pew, what’s that smell?! Somebody needs to have their nappy changed! Have a Sim change a baby's diaper. (If a toddler is going to be running around the house, then you're going to need to impart your knowledge of the world to them. What were all the countries called again? Study a globe to brush up. (Isn't the life of a Sim fascinating? One moment they're just a weird two dimensional icon hovering over a crib and the next they're a baby Sim. 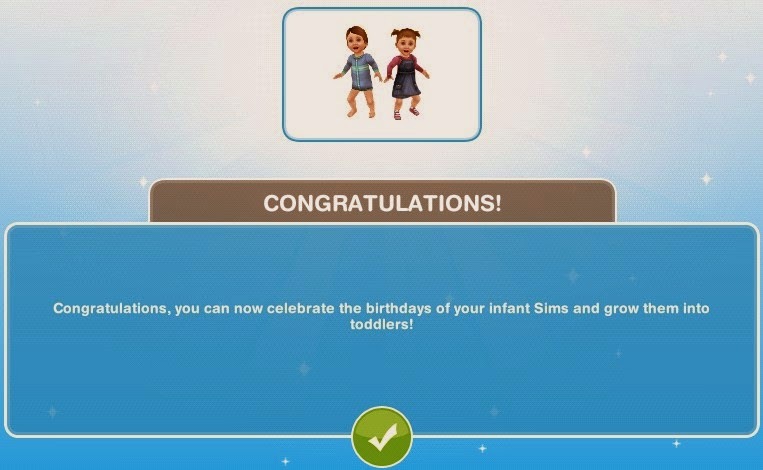 There's a lot to contemplate here..
Congratulations, you can now celebrate the birthdays of your infant Sims and grow them into toddlers! 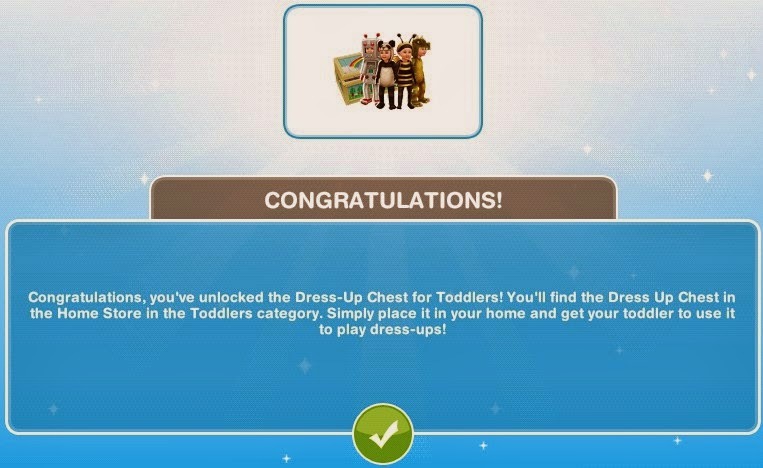 Congratulations, you've unlocked the Dress-Up Chest for Toddlers! You'll find the Dress Up Chest in the Home Store in the Toddlers category. Simply place it in your home and get your toddler to use it to play dress-ups! Please note: Adopting costs REAL money, above level 24 they will automatically grow up in time and can be replaced by having a baby. Money spent on adoption will not be refunded!